Amish Custom Doors custom mills interior and exterior doors in the old-world tradition of one door at a time by skilled Amish craftsman! We specialize in custom designs, building doors to our customer’s specifications and dimensions. We are well known for our Craftsman Style and Arts and Crafts custom interior doors, characterized by square sticking and flat panels. We will build your doors in your choice of woods, including but not limited to red oak, white oak, walnut, cherry, hickory, maple, and knotty alder. Send us your design and door schedule for a quick free quote. Visit us on our web site and see over 5,000 pictures of our doors & kitchens. Amy Brandenburg offers a stunning collection of beautifully crafted and detailed metal jewelry styled after the Arts & Crafts movement era. 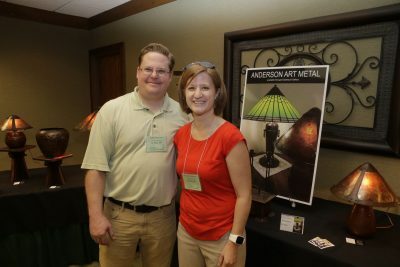 Address: 404 S. Snelling Ave.
Jeb Anderson is an accomplished metalsmith who creates a wide variety of items in the Arts and Crafts style, including lighting inspired by Dirk Van Erp and the Roycroft Copper Shop. He is represented by the Eastwood Gallery, located in St. Paul, MN. 0921 S.W. Palatine Hill Rd. In addition to collecting and dealing in vintage books and ephemera from the Arts and Crafts movement, I also operate Clinker Press -- a private letterpress studio. I am interested in printing material relating to the art of printing, as well as the Arts and Crafts movement. Within this focus I print subjects relating to art and literature. Clinker Press is a full letterpress shop with cold and hot metal type (Ludlow and Intertype), hand presses, cylinder presses (one Kluge and one Miehle Vertical press). I am equipped with photopolymer capabilities for illustration, but magnesium plates are made elsewhere. All books are printed letterpress and are of very limited editions. Archive Edition Inc. offers fine woven American made fabrics for upholstery and home furnishing featuring authentic period style and colors to specifically capture the warm luminosity of early 20th century interiors. Over the past 30 years Paul Freeman has dedicated his life to collecting Arts & Crafts era textiles. With his unique eye for exceptional artistry and deep knowledge of and love for period textiles, Paul has collected a truly unique library of authentic Arts & Crafts textile designs. Archive Edition reproduces a series of carefully selected patterns from this library that we trust you will cherish for years to come. With a background in costume and fashion design, Kaytee has many years of experience working to create customized products and experiences for clients. She also has a great love of art history and appreciation for handcrafted goods. Kaytee has worked as a designer and fabricator for the past decade in cities such as New York, San Francisco, Seattle, and now she is happy to be in Los Angeles working with Archive Edition. Karl Eulberg has been a collector and seller of Arts & Crafts furniture for two decades. His love for period furniture and textiles is equaled only by his interest in E-commerce and making Archive Edition a fun and easy place to explore and shop. We are Barbara Gerr and Arnie Small. We specialize in buying and selling American art pottery, including Roseville, Weller, Rookwood, Grueby, Newcomb, tiles, gardenware urns, and much more. 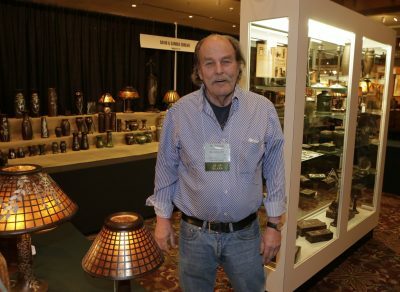 We are members of the American Art Pottery Association (AAPA), where Arnie is Past-President, and the Ohio Pottery Lover's Group, where Arnie is a Trustee. We have been members of the Ebay community since 1997 and we always have an inventory of over 400 pieces of American art pottery. 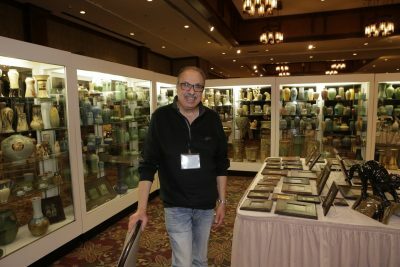 Our show schedule includes the the Twin Cities Arts and Crafts Show, the National Grove Park Inn Arts and Crafts Conference Show, the American Art Pottery Show & Sale (AAPA), the Pottery Lovers Show & Sale in Zanesville, Ohio and Brimfield, MA. You can also visit us at Pinterest, Twitter, Facebook or Instagram. Bungalow Bob’s Pet Designs offers furniture and accessories that coordinate with your Mission, Arts and Crafts, or Prairie Style decor, and add warmth to your home. 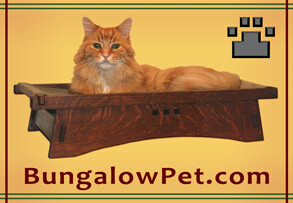 We recognize the importance of pets to our families and feel they deserve the same fine quality furniture we enjoy. Our understated and elegant furniture designs are inspired by the Arts & Crafts movement and handcrafted in the USA from premium quartersawn white oak for beauty, strength, and durability. With extensive use of pinned, mortise and tenon joinery, these pieces are designed to last for years. Our craftspeople meticulously employ authentic methods of joinery and have a profound attention to detail. Carol Eppel and Bob Gangl specialize in American furniture. They sell high quality furniture from the Arts and Crafts period, offering signed pieces in original finish and well made pieces by other known manufacturers. They also offer lighting, art pottery, prints and textiles. Carol has a special fondness for American period country furniture and correct smalls, and Bob likes good high-end Victorian furniture. Carol and Bob sell out of American Gothic Antiques in Stillwater, MN. 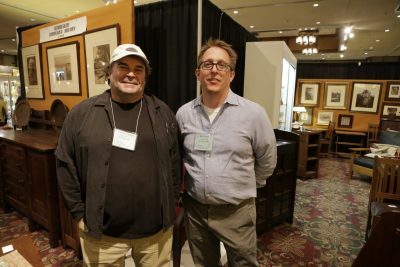 They also sell privately by appointment, and at select national shows, including the National Arts and Crafts Conference each February at the Grove Park Inn. Please contact them via email or telephone number listed below. Christopher Cardozo is widely acknowledged as the world’s leading authority on Edward S. Curtis. He is the author of nine monographs on Edward Curtis and has created and curated one-person Edward Curtis exhibitions that have been seen in nearly one hundred venues in over forty countries. Having collected Edward Curtis’ artwork for four decades, Cardozo has created the world's largest and most broad-ranging Curtis collection. No one has done more to increase the awareness, understanding, and appreciation for Curtis’ work than Christopher Cardozo, except Edward Curtis himself. Please contact him regarding both original Edward Curtis photogravures and new renditions of his work. Cobre is a Fair Trade company and has been “Fairly Traded” since 1994. We currently work with 7 different workshops that employ 1 to 7 artisans. Most of the people in the workshops are related, fathers, sons, uncles, cousins. Each workshop has its own style. One shop makes only small pieces, maximum 3″ high, while another prefers to work in organic forms; pears, apples, gourds, squashes. Ramon’s work is extremely fine with thin walls, while Antonio’s work is thick-walled and monumental. Each piece is proudly signed by its creator. For almost 30 years I have researched, bought and sold the sterling-on-bronze items manufactured by the Heintz Art Metal Shop, (Buffalo, NY, 1906-30). This most unique metalwork of the period has steadily grown in acceptance and popularity. I maintain a large inventory of vases, bowls, desk items, tobaccoiana, and table lamps. A representative selection my be viewed on my website, www.heintzcollector.com. Additionally, I am an annual exhibitor at the Grove Park Inn Arts and Crafts Conference and Show, and am available by appointment in Brooklyn, NY. I am nationally recognized and look forward to help build your collection. 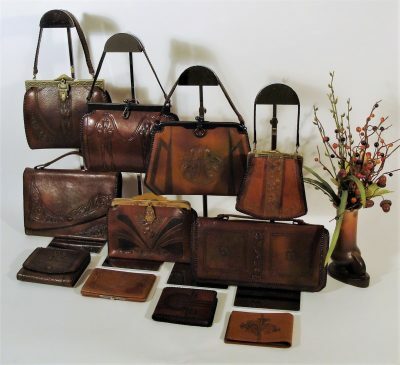 Denise Burns specializes in antique and hand tooled leather goods inspired by the Arts and Crafts era. 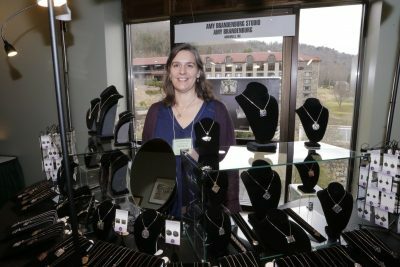 She exhibits at the National Arts and Crafts Conference at the Grove Park Inn. We at Door Pottery are proud to bring you the finest quality handmade Arts and Crafts pottery from our Madison, Wisconsin studio. Located in the Midwest, we are influenced by the natural beauty that surrounds us, the same natural elements that inspired the Prairie School of design. We also draw inspiration for our pottery from the great American art potteries of the Arts and Crafts era. From the organic leaves of Grueby to the elegant shapes of Rookwood, or the surprisingly modern look of Teco Pottery, we pay homage to the Arts and Crafts artisans that came before us. With fresh design and unexpected twists, we strive to carry on the Arts and Crafts tradition, creating unique pottery to be treasured for generations. 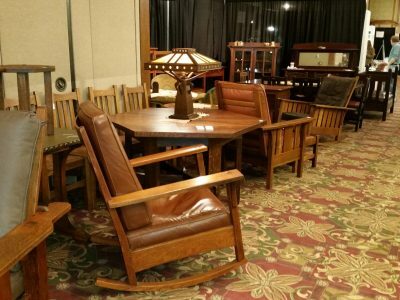 Eastwood Gallery specializes in Stickley furniture and accessories of the American Arts & Crafts Movement (1890 - 1920 ). Our antique inventory is focused on the leading manufacturers of the period and includes Gustav Stickley furniture, L. & J.G. Stickley, Stickley Brothers, Limbert, Roycroft, Rookwood pottery, Weller, Teco and Roseville pottery to name but a few. 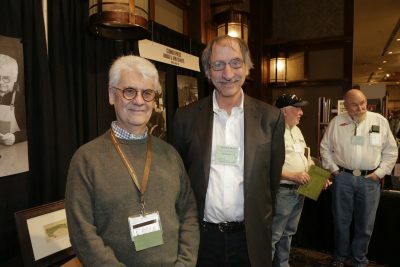 We are also particularly interested in the work of Minnesota and American Midwestern artists and manufacturers, including The Minneapolis Handicraft Guild, John Scott Bradstreet, U.N.D. Pottery, Robert Jarvie, and Kalo silver of Chicago. We also offer a broad selection of lesser known furniture and accessory makers as well. The Intaglio plate is truly a labor of love; a medium that offers the historic tradition and mysterious compliment to my original etchings. Handprinted and watercolored etchings traditionally created on copper plates and printed on a 650 lb press in my Studio in Syracuse, NY. The nostalgic appeal of my fantasy tales, and observations of the natural world evoke a time when books were printed on paper and your own imagination entertained you. 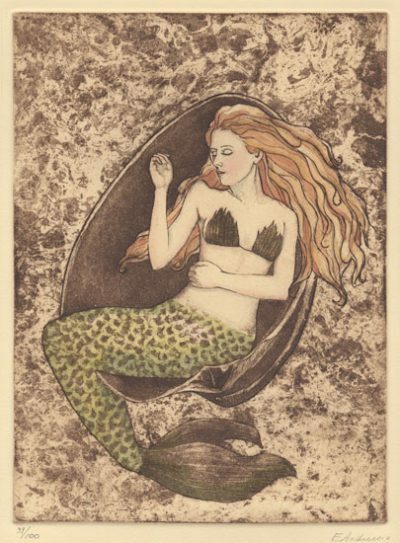 The etching of metal plates enables me to make multiple prints that are all Originals. Commissions accepted and use of my images for publishing is also considered. Address: 2601 W. Farwell Ave.
FMG Design creates only original and custom designs in copper, brass, nickel silver, silver and wood. Frank attended the School of the Art Institute of Chicago and is a Roycroft Renaissance Master Artisan in Metal since 2003. 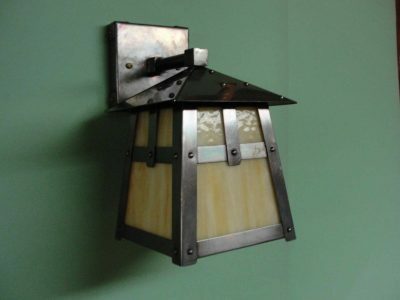 Frank’s work is primarily in the Arts & Crafts and Craftsman Style, inspired by the works of Charles Rennie Mackintosh, Greene & Greene and the Roycroft Art Metal Shop. 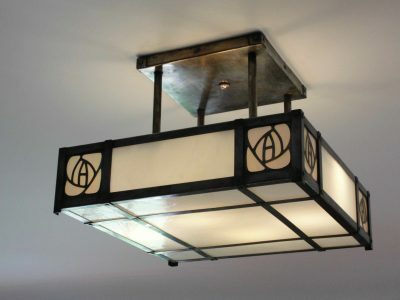 You will find his mailbox and lantern designs on Bungalows, Craftsman, Mission, Prairie and Arts & Crafts style landmark homes in the U.S., Canada, Japan, Australia — and on some Frank Lloyd Wright designed homes. Now he is passing on his repoussé techniques in workshops where anybody can create beautiful works in metal. At Jack Pap, you will find antique Tiffany lamps and Tiffany Studios table lamps, as well as a high quality antique inventory with an emphasis on the Arts and Crafts period, Art Nouveau period and Art Deco period. 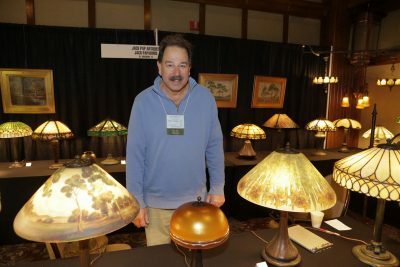 Antique lighting is my specialty, featuring antique lamps by such makers as Tiffany Studios, Handel Lamp, Duffner and Kimberly, Pairpoint, and Bradley & Hubbard. 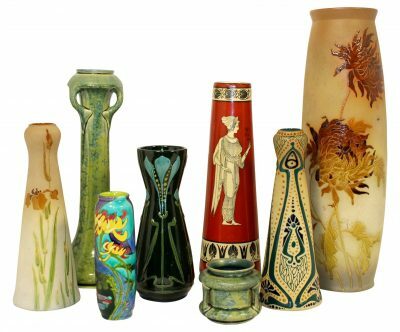 I actively deal in art pottery by Rookwood Pottery, Grueby, Roseville, Weller and others of the period, as well as art glass by American makers such as Louis Comfort Tiffany, Handel, Steuben, Quezal and the European art glass of Loetz, Czeckoslovakia and others. I am very interested in purchasing or brokering items of quality, in particular antique Tiffany lamps. I am also available for appraisals. 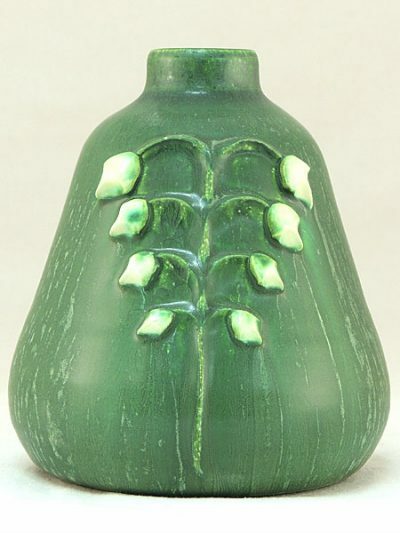 JustArtPottery.com was started in May of 1997 by Greg and Lana Myroth to provide a convenient and safe way for collectors ranging from entry level to highly advanced to find accurately described and fairly priced art pottery. What started as a hobby of collecting Van Briggle pottery quickly grew into a small and thriving business of buying and selling art pottery across the world. We truly appreciate your business and fully guarantee your satisfaction with every item you purchase from us. We pride ourselves in the accuracy of our descriptions and strive to in all cases mention even the most minor flaws in the pottery we sell in order to ensure your highest expectations are met. We have enjoyed meeting so many of our customers over the years both face to face and online and we love talking pottery. Please do not hesitate to contact us with any questions you may have. 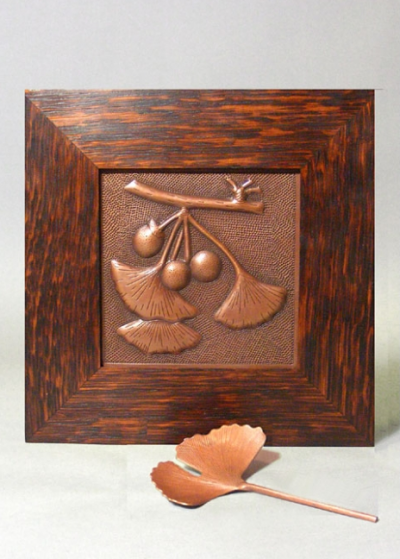 Keith Rust is a Roycroft Renaissance Artisan based in California. He grew up on his family’s ranch in Northern California and is a 5th generation Californian. From an early age he was creating, but it was through his first art professor that he discovered a real love of painting. With his instructor’s recommendation, Keith attended Art Center College of Design to study illustration. After graduating with honors, he began working in the computer game industry as a game artist before rising to the position of Art Director and Vice President of Creative Arts. He thrived in the computer game industry before his interests shifted to becoming a high school art instructor and renewing his love of painting. During his time at Art Center, Keith was exposed to the incredible craftsmanship and esthetic beauty of the Arts & Crafts movement surrounding him in Pasadena, California and quickly fell in love with its beauty and style. Keith has always had a great passion for the outdoors, photography and art, and while remodeling his house into an Arts & Crafts inspired home, he was inspired to design a series of landscape paintings reminiscent of block prints. Keith spent several years developing this new style of painting which pays homage to the Arts & Crafts movement through the inspiring beauty of the great outdoors. His beautifully framed prints are available at retail stores and through his website. Interested in being added to our directory? Submit the form below, and we will contact you with details. The cost for a one-year listing is $99. Additional listings cost $49.